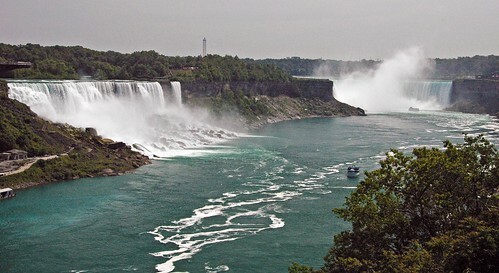 Niagara Falls (= Horseshoe Falls + American Falls + Bridal Veil Falls) formed by water of the Niagara River cascading over an escarpment of Silurian-aged Lockport Group dolostones. This erosion-resistant stratigraphic interval forms an escarpment throughout much of eastern North American (America & Canada), from the Niagara area to Wisconsin. Dolostone is a crystalline-textured chemical sedimentary rock composed of dolomite (CaMg(CO3)2 - calcium magnesium carbonate). Most dolostones form by the diagenetic chemical addition of Mg to pre-existing limestones.